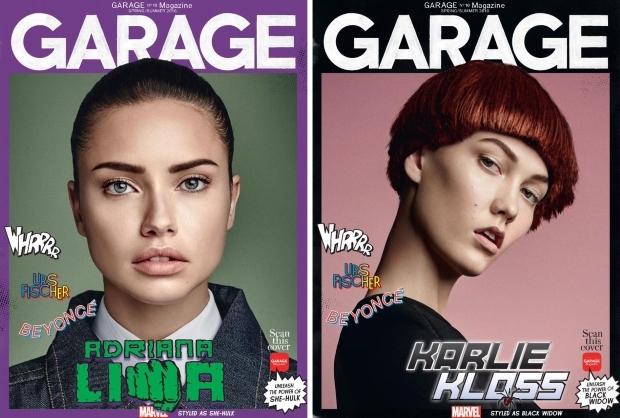 There’s no denying that the majority of the March fashion glossies have failed to deliver, but Garage pulls out all the stops, unveiling a fresh set of covers for its Spring/Summer 2016 edition and having a little fun while doing it. The contemporary art and fashion biannual magazine cast a handful of beauties, including Cuba Tornado Scott, Adriana Lima, Karlie Kloss, Candice Swanepoel and Lexi Boling, to portray Marvel superheroes. Shot by Patrick Demarchelier, it was only natural for the girls to battle it out for best cover. One model certainly stood out from the pack. “Candice,” declared madzedre, stating his number-one straight away. “I want Candice or Lexi’s,” added ThatGuyPaul, suggesting a major rush for Candice’s cover is set to happen. “Very comic book, but still loving Candice!” confessed justaguy shortly after. “Karlie’s is by far the best!” hailed Nepenthes, throwing in his two cents. But not everyone was completely satisfied. “Like the intention, hate the graphics. Garage just hasn’t quite got it… Even this mix of girls seems a bit random,” ranted lewak. Check out the remaining covers and let us know which one you’ll be tracking down here.